November has definitely been one of the most exciting months for unique venues opening in Dublin, we had Hang Dai at the beginning and just by the skin of its teeth, an exciting new concept has opened on Ormonde quay, just a few doors down from the Morrisson Hotel. Bagots Hutton is a name many people may be familiar with, as an established and much loved wine bar on South William St. Building on the huge success of their previous location, Giovanni Viscardi and Brian Deery have taken a huge leap of faith and transformed a cavernous building, full of character into one of the coolest spaces we have encountered in quite some time. The trend towards venues rather than restaurants is certainly nothing new but this incarnation of Bagots Hutton has taken it to the next level. Viscardi explained how his background in the bar and club scene and experience as a percussion player, had left a yearning to create a space that still maintained the charm and relaxed vibe that Bagots was known for but also manage to couple that with an intimate venue for gigs, live theatre, jazz nights or private after parties. As soon as you walk in the door the first thing to strike you is the bold, mustard, Chesterfield sofas and stylish tweed chairs, which after Christmas will house an all day menu and separate bar serving teas and coffee in the morning, to glasses of fine wine in the evening. To the rear of the the space is a raised level, with vaulted ceiling, mood lightning and a small stage which boasts a sound system and lightning rig on par with the 3 Arena. The plan is this will be a venue filling a gap in the market for artists looking for more intimate gigs but still retain the sound quality and acoustics of more serious contenders. 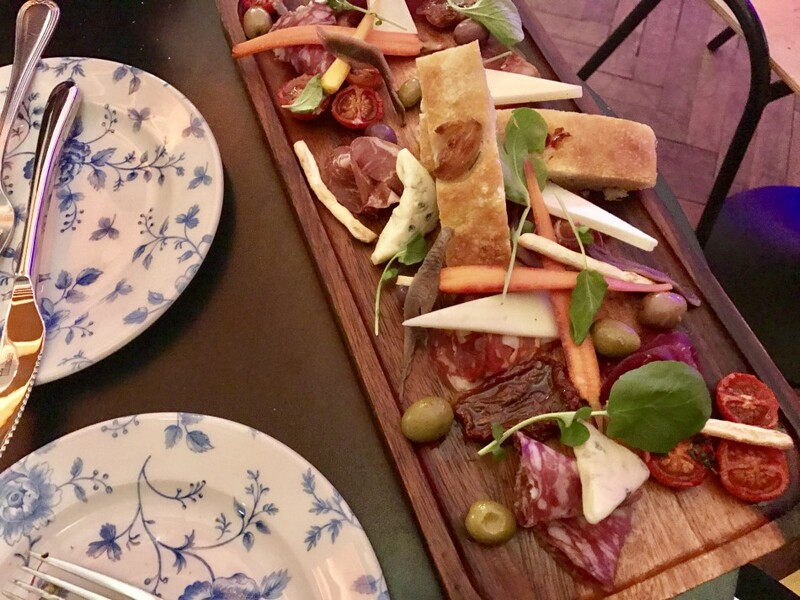 This also doubles up as a relaxed wine lounge where you can enjoy a beer or glass of wine or indulge in some of their generous antipasto boards, cheese plates or delicious home made pasta dishes. In the basement you will find the candlelit “Club BH”, huge booths, striking artwork and an open plan kitchen with Tuscan imported wood fired oven. With a metallic ceiling reminiscent of the Liquor rooms across the water and surprises around every corner, from the striking artwork to the stone horse trough flown over from Viscardi’s hometown of Tuscany that now sits in the unisex bathrooms like it was always part of the building. 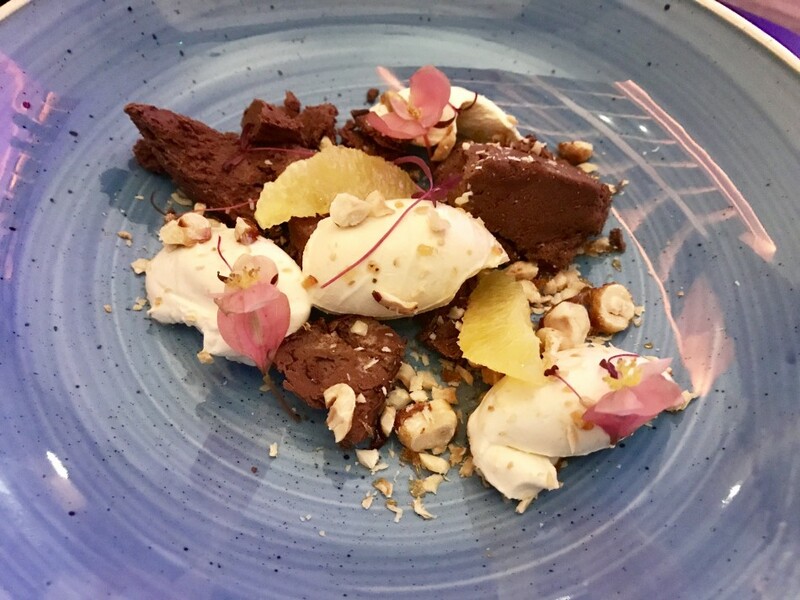 The menu at Bagotts Hutton is still evolving, having only been open five days and still finding their way around the new kitchen but Head Chef Sam Carey, previously of De Selbys and Coppinger Row, has come up with some super plates of food. 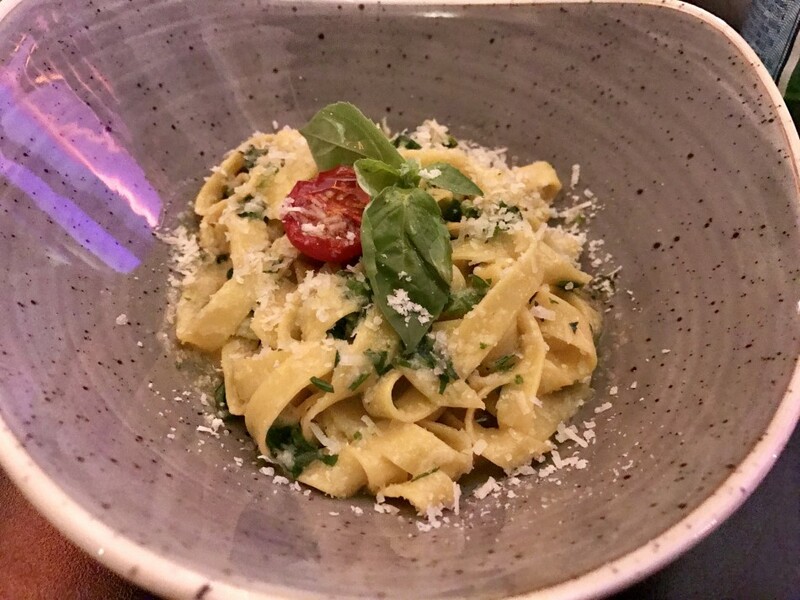 All of the breads, pizza bases and pasta are made in house. We sampled several sharing dishes last Tuesday, starting off with some plump Oysters from Harty’s in Dungarvan, in a caper and shallot dressing and a tasty little dish of creamy Crayfish and Anchovies with some toasted breads. A glass of wine and a good Mixed Board are as close to heaven as we can get, priced from €15 for a sharing platter for two or €25 for four, these generous plates are packed with garlic salami, parma ham, slices of sweet bresaola which worked beautifully with the chunks of Parmigiano-Reggiano and salted Pecorino. 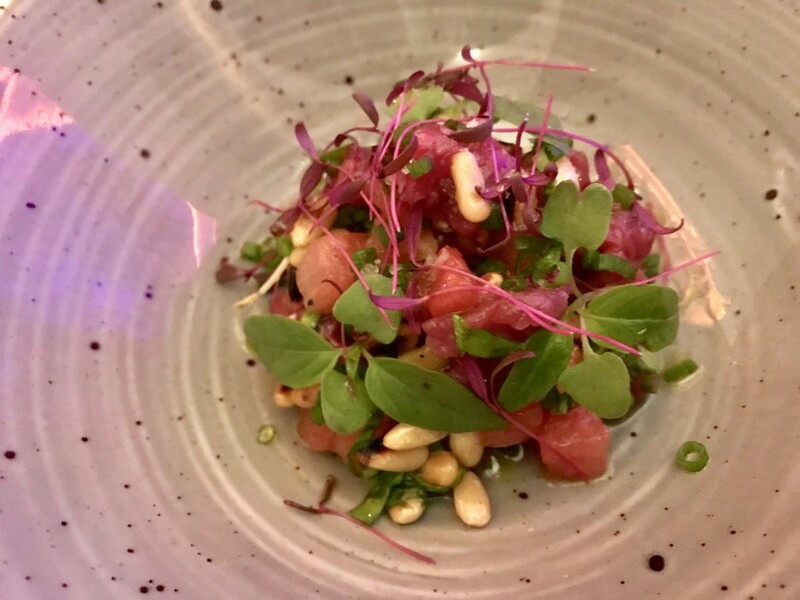 Next up was an unusual little dish of of Veal Tartare with pickled watermelon, pine nuts and tomato salsa, this should not work but was one of the best tartares we have tasted in some time and is guaranteed to win over the biggest doubters of giving a tartare a go. Slick Italians with a New York style are apparently very much back in vogue with John Farrell and Leo Molloys Luna leading the way so no surprise to see a Truffle Pasta listed, the marmite ingredient for many is handled delicately enough in Bagots Huton with a light sprinkling balancing out the pasta perfectly. 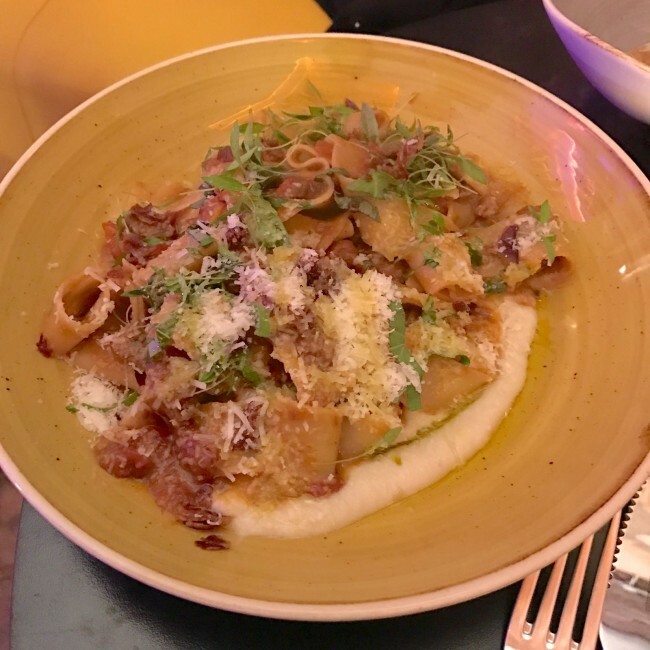 As all the pasta is produced in house we couldn’t resist a large bowl of Veal Ragu, dotted with chunks of braised meat that fell apart with the mere tackle of the fork, which came in handy considering one of us was dining in an elegant arm sling. We finished a great evening listening to some smooth tunes over a picture perfect plate of Mascorpne & Chocolate speckled with little nuggets of hazelnut and two zingy wedges of orange – pure bliss. Viscardi and Deery have taken on a mammoth project here at Ormonde Quay and you have to admire their balls, they have created a space on the Northside that has never existed, a creative space with good wine, great food and soon to be some of the best entertainment the city has seen – long overdue we think.